Dep FM Ayalon Surprised at PA Negotiator Erekat's Rejection of a Public Debate: "The Palestinians are only able to debate unilaterally"
Today (Sunday 31st July), Deputy Foreign Minister Danny Ayalon responded to Palestinian Authority Negotiator Saeb Erekat's rejection of a public debate. Earlier, Ayalon had proposed a public debate on issues relating to the Israeli-Palestinian conflict after Erekat sent out an official press release calling the Deputy Foreign Minister's recent YouTube video titled The Truth About the West Bank, "a falsified account of history and international law". "I am more than a little surprised that Erekat rejected my offer of an open and public debate, especially considering he was concerned enough about our video to release a two page official press release" Ayalon said. "Erekat is used to telling the world that Israel's policies are illegal and against international law and I offered him the chance to back up his own statements and he is proving unable or unwilling to do so." The video released under two weeks ago, has already garnered a quarter of a million views worldwide and is encouraging a debate on the rarely heard Israeli position on the West Bank, settlements and international law. The Government MUST lower the Temperature! The Israeli government has gone too far -- PM Netanyahu and his right wing cronies in Yisrael Beiteynu, led by the evil oligarchic Avigdor Leiberman have allowed rising temperatures across Israel to reach unbearable heights. Israel's shrinking middle class simply cannot afford this kind of heat anymore...or full home central air-conditioning. We will NOT allow these high temperatures to continue, and demand immediate government intervention! As the upper class surrounds itself by wall to wall air-conditioning, Israel middle class is left to suffer, simply because Israel's obtuse government refuses to acknowledge the problem. 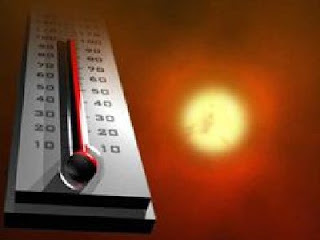 Netanyahu's apathy towards the hot-weather demonstrates why we need immediate action by all those cool-headed leaders of Israel, such as Tzippi Livni and Dr. Ahmed Tibi who have a proven track record of listening to the public, and ensuring cooler weather. We demand that the government immediately introduce legislation to cap the national weather temperature limit at 30 degree Centigrade (or 86 degree Fahrenheit). We are planning a demonstration in the coming days, as we drive air-conditioned cars on the road from Tel-Aviv to Jerusalem, to express our outrage at the high temperatures and the apathy of the government. Netanyahu: Stop the Occupation, Condemn the Charieidm and Settlers, so that you can focus on the real issue of lowering the temperature! PS: We graciously thank the kind people at the New Israel (lower temperature) Fund for helping fund our apolitical campaign. "T.O.T. private investigation & Consulting is a full-service, bonded New York private Investigation firm that has been conducting professional Investigations and surveillance worldwide for over 14 years. We Specialize in the Jewish orthodox communities, using only highly Trained professional male and female investigators (Jewish or Non-Jewish)." Duran had to leave a message because I was on the other line to the Orthodox Union, whose voice-mail recording describes it as “the global leader in Kosher supervision and the world’s largest Jewish resource.” (So much for the Torah and the Talmud.) 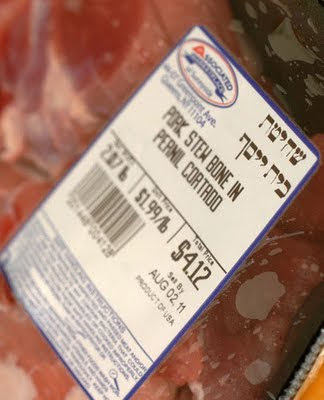 I pressed two for matters Kosher, and listened to another menu until I heard: “To report a product that may be mistakenly labelled, press four.” I did, and was invited to leave a message for Howard Katzenstein, who called me right back. “I have to tell you,” he told me, “my father-in-law read your magazine religiously—or some would say irreligiously. How can I help you?” I told him about the kosher pork for sale in Sunnyside. “If the price is right, I say go with it, right?” Katzenstein said, and giggled. Where is Israel's Middle Class? One of the Israeli media's favorite government slams these days is "the tent-housing protests are proof that Israel's middle class is disappearing." For those of your not in Israel, the "tent" protests are the number one news item, as the media does all it can to pump up the story against the government. I heard an interview on IDF Radio (Galei Tzahal) the other day, where foreign press reporters were being asked why the tent story wasn't huge news around the globe. So I started looking, where is Israel's middle class? Maybe the middle class is swamping the malls of Israel, which are full to capacity of wall to wall buyers and spendors. Perhaps they are filling the cafe's of Tel Aviv, which are bustling with customers throughout the day. So who has time for the "tent" protests? Don't these people work at all? If they are the "middle class", why aren't they working? Yet the real problem is lurking just around the corner. Well, the "worst case" could be a huge drop in the housing market, causing all those investment apartments to lose value, lose their rental value, and the middle class investors will find themselves with high mortgage payments and no way to cover them. As they start defaulting on mortgages, the banks won't even be able to recoup their loss by selling the real estate, since its value has also plummeted. Banks will start losing money at a phenomenal rate, and that affects the more solid investments of the middle class...our pensions. So where is the middle class? On vacation, eating out, or working. The one place you won't find them is at the tent protests. Today, Israel's Supreme Court rejected the appeal of IDF soldiers against the film, "Jenin, Jenin." The court did rule that it film was full of lies, it technically didn't slander 5 specific IDF soldiers who brought the lawsuit against the film's director. Shortly after the film's release, it was banned by the Israeli Film Board on the grounds that it only showed one side of the story and that it was slanderous. The five soldiers' lawsuit included 13 incidents it describes as libel, including a section of the film that had been edited to give the impression that a bulldozer had run over a group of Palestinians lying on the ground. 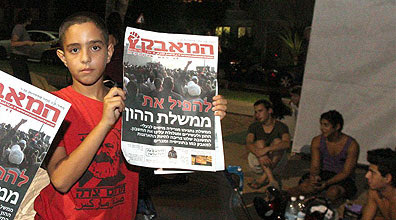 In dismissing the suit, the judges ruled that even though Bakri's film was "full of things that are not true" and even though it was hurtful to the feelings of the five soldiers, there was no provision under the law for them to bring a civil claim against Bakri because the film made reference to the IDF's operations in Jenin as a whole and not to any specific soldier. "Attributing acts such as those described in the film to IDF soldiers are some of the worst accusations that can be thrown at someone. It puts them on a par with the very worst war criminals and the very worst murderers. The allegations in the film are very severe and cannot be underestimated," wrote Judges Miriam Naor, Yitzhak Amit and Yoram Danziger. Who cheers for director Bakri -- Palestinians? Neo Nazis? Terrorists? The folks running the "New Israel" Fund refer to Bakri, the film's director as "an esteemed actor and director" and they even gleefully sponsored a screening in New York of his latest anti-Israel film. Proudly informing the world of their support for Bakri, the New Israel Fund put this information on their own website! (You don't have to look very hard to find it). If you want to fully understand what the New Israel Fund is all about, you just need to understand that they support some of Israel's worst enemies, who have been unmasked by Israel's own Supreme Court. The New Israel Fund is proudly supporting a director whose film is "full of things that are not true" [LIES], a film that is hurtful to IDF soldiers, [SLANDER] and "Attributing acts such as those described in the film to IDF soldiers are some of the worst accusations that can be thrown at someone. It puts them on a par with the very worst war criminals and the very worst murderers. The allegations in the film are very severe and cannot be underestimated." [SEVERELY ATTACKING THE IDF]. Freedom of Speech is crucial to Israel's democracy. Why the New Israel Fund advocates free speech, yet associates itself with slanderous liars like Muhammad Bakri, makes you wonder what sort of "New Palestine Israel" they are trying to fund. Unmasking the New Israel Fund. Video: Hadassah Hospital's "Get Well Soon"
Nice Video - Glad to see they have some creative people there in addition to their world class medical staff! hat-tip: Everyone's favorite funnyman, Benji Lovitt. Call me cynical, but with the tent cities popping up protesting the “housing crisis”, I’d like to propose a number of ideas that can solve this problem. 1) Massive construction in Judea and Samaria. It costs a lot less to build in Judea and Samaria and it can be done much faster than in the built up areas of Gush Dan and Jerusalem. In fact, there are plans ready for 100,000 apartments that can be built within a year, if only permission were given. And best of all. The Shomron is a 15 minute drive to Gush Dan, and Judea is a 15 minute drive to Jerusalem. Wide spaces, empty areas, great air. 2) What about those illegal refugees? 3) More construction in Gilo, Har Homa, and Eastern Jerusalem. Thousands more apartments could be built, if only the government had the support of the people stop the virtual freeze of Jewish housing. While I have some problems with it, Netanyahu’s land reform bill would have freed up lots of state land for housing. Show your support for Netanyahu. 5) Stop destroying outposts and Migron. You would expect to see a little solidarity here. All these people want is a place to call their own, just like you. Meanwhile the government/IDF comes along and instead of providing that final signature that would make everything legal, it destroys people’s homes leaving them homeless. What kind of sympathy are you looking for, when you don't care about their going homeless? For some reason the settlements have been dragged into this, claiming that they siphon the money away from building in Gush Dan! Well, the way I see it, with somewhere between 350,000 to 750,000 settlers (depending on who you count), that’s a lot of housing to be built, not to mention schools, kindergartens, shuls, mikvahs…. Where exactly would these people live otherwise? You say yourselves complain there’s no housing anywhere. You want to send them to the Negev? But you yourselves don’t want to go there! And how much more does it cost to build a home in Gush Dan compared to a Settlement? 3 times the price? 4? 5? Do the math. Settlements are saving the country space and money. You should be kissing the Settlers feet, because if 700,000 of us (who work for a living) were forced to move, we’d certainly buy up prime housing in Gush Dan and definitely force you out to the periphery. Davka. A number of politicians made their way to the tent city to listen and speak to the protesters. Only they found themselves physically attacked. Well only those not associated with Meretz and the Arab parties. If you want to have the people in charge hear you, it doesn't really make sense to pelt them with eggs and beer bottles, now does it? Since it’s allegedly the New Israel Fund and the “National Left” that have apparently been buying the tents and helping organize the protests, you’ll never hear these points raised as a solutions to the problem, because the agenda isn't housing (as real as the problem is), the agenda is apparently just another attempt to topple the government. Labels: Homeless. Tent city. Protest. NIF. Ha’aretz has come out swinging with an editorial condemning various initiatives (initiatives, not laws) openly designed to introduce our children to concepts such as national pride, civic duty, volunteerism, national history, not to mention, knowledge of their history and heritage. 6) Adopting graves of soldiers fallen protecting our country. I don’t know about you, but in America growing up, we pledged allegiance every day in the elementary school where I went, starting from kindergarten (eventually the national anthem and Hatikva too on occasion). We discussed what the pledge meant. We visited Washington D.C., and all the important historical and political sites. We were even taught to stand up in respect when any important person entered the room. And I won’t deny it. Even today, seeing the American flag wave makes me proud. I don’t deny that I believe in the underlying goodness of the United States (even when it makes mistakes, or the State Department gets uppity). And I can’t deny that I do love the USA. So I do understand Ha’aretz. These are fundamentalist, Machiavellian initiatives, especially when you don’t believe your nation is fundamentally good, when you despise your national history and heritage, and when you see no reason to respect those that are willing to fight and die for you so you can live free. I wonder if they had had these initiatives where the Ha’aretz editors went to school, if they would still denigrate their country and its symbols, and apparently despise so many of their fellow countrymen as much as they obviously do. Today the Knesset is debating a proposed Knesset parliamentary investigation into NGOs funded by foreign countries. These NGO's for example, were the research backbone of the slanderous Goldstone report, which slandered Israel and the IDF for the Cast Lead operation. The left is demanding that foreign counties be allowed to fund these NGOs without investigation and without hindrance. "Take off your shoes, when speaking about these [holy, left] organizations!" I'm reminded of the following picture of Ra'aya Yaron, an active member of the "Coalition of Women for Peace" -- one of the numerous left wing organizations that would be investigated by the proposed Knesset investigation committee. She is seen consoling the mother of the terrorist who butchered the Fogel family in Itamar this past year. Yes, take off your shoes when mentioning these holy organizations. I've been thinking about this for months and months. As a weekly supermarket shopper who spends hours shopping, are there viable alternatives to physically shopping at the the Rami Levy supermarket? While it's fun seeing people I know at the supermarket, the whole event takes at least 2 hours, and at the end of a long work day, I wish there was an easier way to shop. 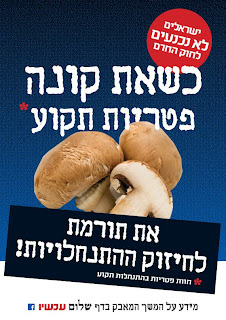 And then...I found the following posting today -- The On-Line Guide to [supermarket] Shopping in Israel...courtesy of The Big Felafel Blog. The Truth about the "West Bank"
Today is the 17th Day of the Hebrew month of Tammuz. The Jewish people fast today to commemorate that on this day, the walls of the city of Jerusalem were breached by the Romans, and in only 3 weeks, the Romans would destroy the Jewish Temple. The JPost "In Jerusalem" section had 2 articles recently about how Meretz has joined the Jerusalem Municipal Coalition Government, courtesy of Aguda and Shas. The scanned in articles (for downloading/reading) are here and here. Rahel Azaria is a religious woman, and the head of the local Jerusalem party "Yerushalmim", a party whose primary focus is on social and environmental issues. (c) she is a woman. Meretz quit Barkat's coalition a long while back because they were angry about Barkat's alliance with the Mafdal/Ihud HaLemui, particularly his support of Aryeh King's activities in east Jerusalem and his support for the Jews living in Beit Yehonatan in Silwan. A few weeks back, Barkat was forced by the Knesset to appoint an 8th (!) deputy mayor, even though he didn't really want to. His choice was Rahel Azaria. Shas and Aguda threw a fit, and threatened to quit the coalition if Azaria was to be appointed. "As for the results of the decision [for Meretz to rejoin the coalition], this is close to an earthquake. For the first time in 44 years, a radical leftist who declares openly that east Jerusalem is under occupation has been officially appointed to be in charge of that part of the city. Meir Margalit, for years a member of almost all the radical left-wing Israeli organizations and currently field coordinator of the Israeli Committee Against House Demolitions -- the organization that helps Arab residents fight against demolition orders of illegal constructions -- and very active in Yesh Gvul's attempts to bring to justice IDF officers suspected of war crimes, an active member of the Sheikh Jarrah solidarity movement and a strong supporter of a divided capital, has been made responsible for implementing the municipality's sovereignty in east Jerusalem. Asked how he would combine his personal opinions with the new task, Margalit says, 'I am full of hope and fears. I want to focus on the welfare of the Arab residents of Jerusalem [and not the Jewish ones, apparently - Lurker] until there is a Palestinian state, hopefully created in September, and that Jerusalem would be its capital'." This, then, is what Shas and Aguda politicians have accomplished for us in the Jerusalem city council. With their threats and maneuvers, they succeeded in keeping out a religious woman who supports all the issues of consensus in the reliigous community -- and instead forced upon us a radical anarchist who hates religious Jews and who plans to actively undermine Israel's sovereignty over east Jerusalem, including the Old City. You might think that Shas and Aguda would be taken aback by the frightening results of their political moves, and that they would feel regret over having brought this dangerous, extreme leftist into power. 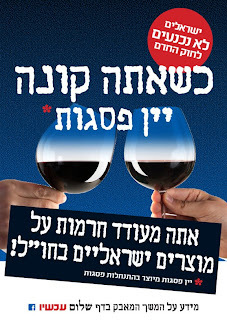 "At the [city council] meeting last Thursday, Shas party leader Eli Simhayof was furious. But not because of the return of Meretz to the coalition. 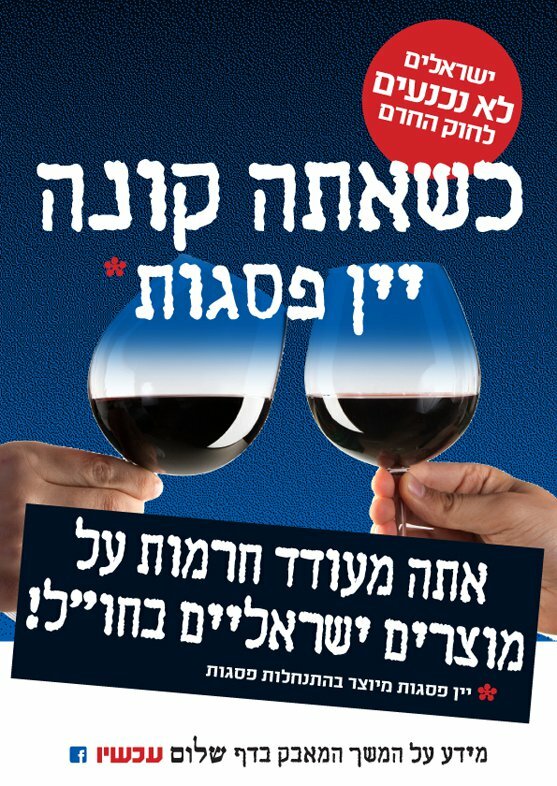 On the contrary, this was cause for Simhayof to celebrate... "For us", [said Simhayof,] "Meretz is better than... Rahel Azaria, so we won our case". A Blog Posting that all Israelis can agree on. Finally, after searching high and low for a common denominator post that will resonate equally among all Israelis, I have decided that enough is enough. If there is one issue that we can all rally around, it is the annual, insane cost of school books. Since the vast majority of school children in Israel benefit from State-funded public education, it is insane that school books are the responsibility of the parents. According to a recent Knesset Committee report, the average 3rd grade student needs to pay 550 NIS per year for school books, and the average 4rth grade student, 590 NIS. As your kids advance in school, the charge for school books goes up. The most depressing item is the statement that: "The Ministry of Education does not regulate school books. The expense of publication of new books and revisions is wasteful, and the parents pay the price." Instead of having a printed, hard cover text book that gets reused from year to year, exasperated parents need to buy brand new revisions, with workbooks that are only partially used every year (and then thrown away/recycled). Why aren't students required to simply copy the questions over into a notebook, along with the answers? While frustrating to students, this is one of the most time-tested and true methods of remembering material. Not only is the payment for the books a problem, but the pain in the backside of having to buy all the books, per child, which are never fully in stock, and never all at the same book store. "Oh, we don't have that book in stock yet...try again in a week...or try another store..." -- and if you have a few children, this entire nerve wracking episode is completely superfluous. Why aren't all the books available -- from the school, for free? Heck, I'd even pay some money if the school would take care of providing all the textbooks. Apparently, MK Anastasia Michaelli is leading the campaign for better solutions. I hope that she manages to improve the current situation. Tent City Protests Around Israel. Why? Almost overnight, a new sensationalist "tent-city" protest has sprung up in cities around Israel. Ostensibly, the protest is apolitical, demanding a social housing agenda to lower housing prices in Israel. The "Israel Today" newspaper claims the tent city protests are funded and organized by the "National Left" organization, but I understand that right wing groups such as Im Tirtzu have joined as well. Anyone with a brain in their head knows that the current housing crisis has nothing to do with the current government; the policies of the past 10 years have brought us to where we are today; the Barak Government, the Sharon Disengagement Government, the Olmert and Livni government. Israel has been building 10,000 homes less per year than they should have for the past 10 years. Two questions remain: If this really is an apolitical issue, why are tent city protestors holding up signs (pictured right) which say, "To Overthrow the Government of Wealth." Shouldn't it say, "Housing for all?" 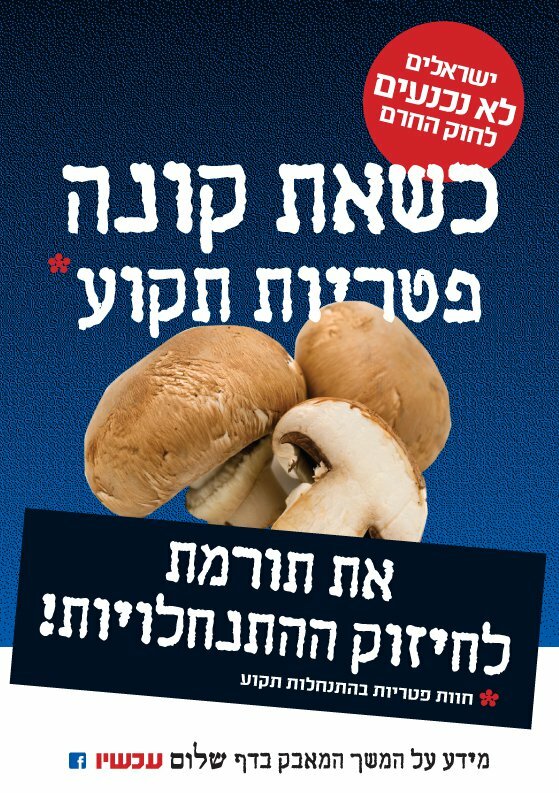 How come not one TV or radio commenter has asked a government official, "Has the Jewish building freeze in Judea and Samaria contributed the growing prices for homes in the rest of the country?" This past week, a left-winger I know tried to explain to me the dangers of Israel's newly legislated "anti-boycott" law. I asked how come it was perfectly legal, democratic, and acceptable for left-wingers to boycott produce from the settlements, yet it was illegal, undemocratic, and unacceptable for Jews to not rent homes to Arabs in Tzfat, who are harassing their Jewish neighbors. The answer I received is that not renting homes to Arabs is racist, yet boycotting produce from settlements is an "expression of political freedom." I don't understand why when left wingers boycott Jews from the settlements, and its called "political freedom" (after all, the expressly do NOT boycott from Arabs in the West Bank), yet refusing to rent your home to an Arab in Tzfat is considered racism. Actually, the people hurt most by the left's boycott of settler produce, are Palestinian workers from the Palestinian Authority who are the primary employees. At first I though that "Expression of Political Freedom" must be some sort of a code word for "stab Jews in the back" -- instead, I realize its just "stab everyone in the back." 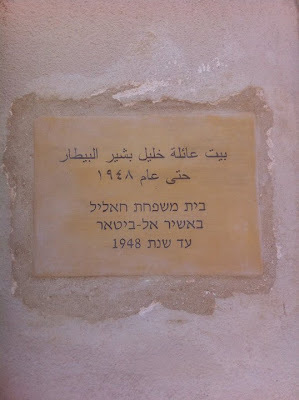 Gilad Evron, a "noteworthy" leftist was shocked and appalled to learn that his spacious home in Tel Aviv-Yaffo, 15a HaTzadaf Street used to belong to an Arab family prior to their running away (or eviction) in 1948. So what did Evron do? Find the family and give his home to them? Find an alternative Arab family and give it to them? Find any 1948 Arab refugee and offer it to them rent free? Evron did something far more noble. As he and his fellow left wingers call on boycotts of settlement produce and call for the removal of all Jews from the territories, we can all be proud that Evron has done the right, non-hypocritical thing, and placed a sign on his home. Now that's expression of political freedom. N.B. : The JPost has a good Op-Ed piece today about the anti-boycott law; how today’s champions of free speech are yesterday’s censors. More insidiously, Israel is held to a standard never applied to the rest of the universe, and Israel is criticized for passing laws that are well within the western democratic mainstream. 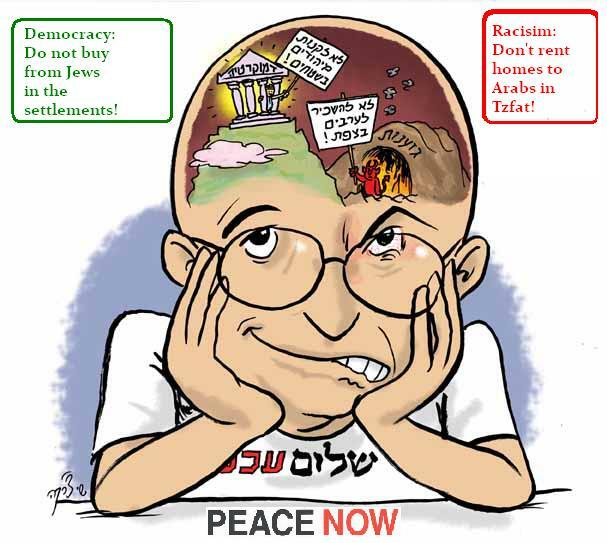 Cartoon courtesy of Shay Charka -- the official political cartoonist of Makor Rishon. Labels: anti boycott law, Israel. Traditionally he is called the Shabbos Goy ("Goy Shel Shabbat" in Hebrew), and historically he plays an important and honorable role in the smooth functioning of Jewish society and household. His job is simple. Religious Jews are prohibited from doing certain activities on Shabbat, hence they turn to their non-Jewish neighbors when there is a problem that needs to be resolved (such as the air conditioner went off, someone forgot to turn on the bathroom light, or pressing the elevator button for the old man who can't walk up the stairs). Some famous Shabbos Goys include General Colin Powell (who even speaks Yiddish as a result), Mario Cuomo, Martin Scorsese and even on occasion Barack Obama. And Jameel has asked that famous question as to how a modern Jewish state should function, do we rely on Shabbos Goys, technology, or is a Jew permitted to "desecrate" for nationally required purposes (police, electric company workers, etc.) It's a fascinating and not simple question. In previous posts, Jameel has shown some of the latest technological tools that the Tzomet Institute (and others) have created to help sidestep these problems. But Tzomet now faces some serious competition. Have you ever plugged in one thing into the socket, and the fuse/breaker box for the whole house blew? It just happened to me this Friday, so I found this to be rather timely. Two boys in 9th grade (for a school project) created the "Goy Shel Shabbat" fuse box. Nir Reiter and Omer Badash connected a computer circuit to a fuse box. When the main circuit blows it checks to see which breaker actually caused the problem. It keeps that one closed and resets the rest. No need to call the (human) Shabbos Goy for this problem (unless that was the switch you needed). I see a bright future for these two. Labels: Tzomet Institute. Shabbos. Shabbat. Who does the boycott hurt? 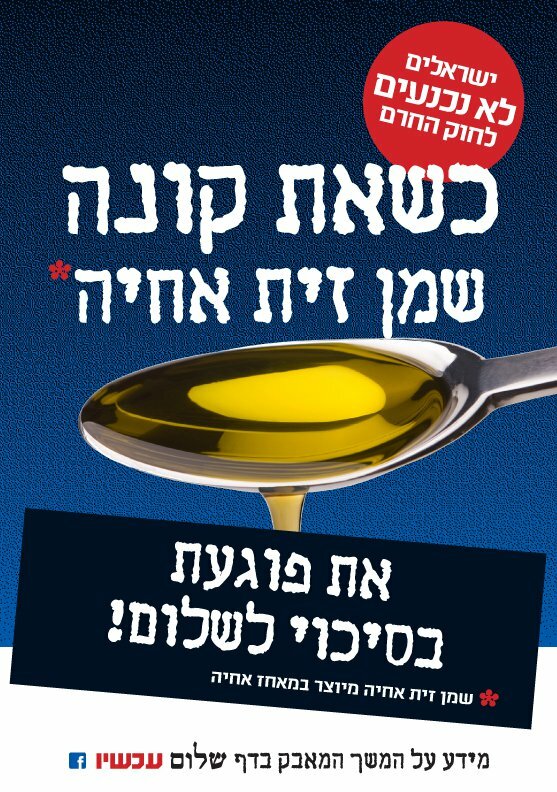 In response to the anti-boycott law, Peace Now went all out and declared a boycott on products from Judea and Samaria. They printed up fancy ads listing the top companies to boycott. Other leftists went around putting stickers on “Settler” products in stores. 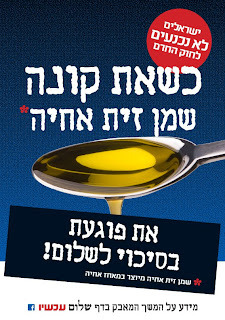 The number one company on the list “Meshek Achiya” a producer of fine olive oil reported a record jump in sales in Israel this week. The same for Psagot Winery and Tekoa Farms. In fact, all the companies that the Left targeted reported a jump in sales. Why? Because the average Israeli wanted to show their support to the Settler enterprise and against boycotts of Israel and against the Left, and the Left told them who best to buy from to show that support. But the real question is, who does the boycott really hurt? Let’s start with Gush Katif. The 8000 residents of Gush Katif accounted for 10% of international sales of agricultural products from Israel. Who did the disengagement hurt? But it also hurt the Arabs of Gaza, who were gainfully employed at salary levels above those they would have in their own market. But let’s talk Judea and Samaria. There are some 788 factories in Judea and Samaria (including of course the Jordan Valley). The factories produce for export at least $100 million dollars in sales (I need to check if that is per month or per year). Of the 17,000 employees of those factories, 11,000 are Arabs (“Palestinians”). Some 100,000 family members of these 11,000 Arabs are dependent on these Settler factories. That doesn’t include the Arab satellite companies that opened up, such as taxi and food services. And the salaries these factory employees get (along with the associated social benefits) is far more than they could possibly get in the PA work market. I might also mention that these factories are typically models of peaceful coexistence (except when the occasional Arab employee tries to kill some Jews). A while back, one Israeli company decided to move out of the Barkan (Settler) Industrial Park because of the pressure from the Left. As a result, its 90 Arabs employees were fired as they couldn’t work within the “Green Line”, the Jewish employees merely had to commute in the opposite direction. The firing of 90 Arabs means that some 800 Arabs no longer had a provider of income. The truth is, a successful boycott would in reality hurt the Palestinians far, far more than it would hurt the Jews. But don’t confuse the Leftists with that piece of information, because their calls for boycott are helping improve the Settler economy they hate so much. Oh, and here’s a question for you (as asked in Makor Rishon). If Ahmed Tibi, an Israeli citizen currently living over the Green Line (making him a Settler) were to open a factory, would the Left call for its boycott too? Or are their calls to boycott actually racist and only targeting Jews? The NY Times has a fascinating article today, about the Majorcan community -- from an insular island off the coast of Spain,...a community of about 20,000 people, and how an Israeli Chareidi Relgious court under the leadership of Rabbi Nissim Karelitz has ruled that the community is Jews. PARIS — Centuries after the Spanish Inquisition led to the forced conversion of Jews to Catholicism, an ultra-orthodox rabbinical court in Israel has issued a religious ruling that recognizes descendants from the insular island of Majorca as Jews. The opinion focused narrowly on the Majorcan community of about 20,000 people known as chuetas and did not apply to descendants of Sephardic Jewish converts in mainland Spain or the broader diaspora of thousands of others who scattered to the Ottoman Empire and the Spanish colonies in South and North America. The island, isolated until a tourist boom that began in the late 1960s, is a sociological preserve for descendants of Jews who formed an insular community of Catholic converts that intermarried through the centuries because of religious persecution and discrimination that barred them from holding certain positions in the Roman Catholic Church through the 20th century. Most carry the names of 15 families with ancestors who were tried and executed during the 17th century for practicing Judaism. The religious court in Israel, led for more than 40 years by Rabbi Nissim Karelitz, sent another rabbi to the island in May to explore its warren of streets where a synagogue once stood and to examine the family trees of some of the chuetas who trace lineage back 500 years. In May, the regional government of the Balearic Islands became the first to create a memorial ceremony for Jewish descendants, marking the deaths of 37 people who were executed in 1691 by the Inquisition, and expressing regrets for persecution that chueta families suffered through the centuries. What that means in actual practice is still evolving. 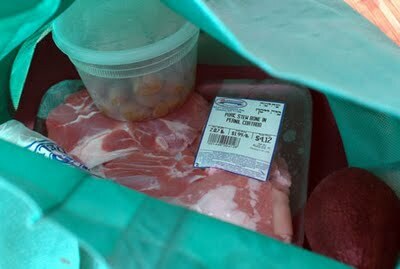 Mr. Aguiló said he hoped that it would inspire the state of Israel to grant citizenship to the chuetas. For now, Rabbi Wiesel said, the next steps for the Spanish island were more modest. I haven't seen any news about this in Israel...and find it interesting that this first popped up in the NY Times. For the fourth time since the "Arab Spring" started flourishing in Egypt, (when an 18-day uprising toppled President Hosni Mubarak's regime on Feb. 11,) Egpytians have sabotaged the Gas Pipeline between Egypt, Jordan and Israel. The officials said the attack was carried out by at least four assailants. The terminal is located in the city of El-Arish in the northern part of Egypt's Sinai Peninsula, about 30 miles (50 kilometers) west of the Israeli border. With an Arab Spring like this, it makes hay-fever seem like child's play. Labels: Arab Spring, Egypt, Gas pipeline, Israel. Israel passed an important bill today that calls for sanctions against those who declare economic, cultural or academic boycotts against the state of Israel, its institutions or any area under its control because of their connection to Israel. That boycott would be a civil offense and subject to litigation. As the Muqata’s recent successful counter-boycott of Scottish Whisky (in response to the anti-Semitic Scottish West Dunbartonshire council’s boycott of Israeli books) proved, taking a proactive stance against these boycotts and the BDS movement works. The authors clearly had in mind the BDS movement, the PA boycott, the Scottish West Dunbartonshire boycott, and the 20 Israeli companies that signed boycott agreements with the PA. I believe this is the final wording of the bill (and a translated version is here). What is clear is that it is solely in reference to those who would do this to harm Israel (not the Cottage Cheese boycott for instance). But as usual, the suicidal Left is frothing at the mouth, muttering inanities in their attempt to disarm Israel’s right and ability to defend itself. And of course hoping you won't read the bill to see what it actually says. MK Eitan Cabel (Labor) called the bill "a cowardly law," and "another law in a series of fascist laws drafted by the government." Kadima statement: He [Netanyahu] has crossed a red line of stupidity and national irresponsibility… The boycott bill is a mark of disgrace for Netanyahu's government and the State of Israel and its citizens will pay for it dearly. Knesset Member Ilan Gilon (Meretz), "I know of nothing that causes more de-legitimization for Israel abroad than these acts of legislation". MK Shai Hermesh (Kadima) said the bill harms basic rights. The Association for Civil Rights in Israel called it "an antidemocratic step, intended to create a chilling effect on civil society." Adalah – the Legal Center for Arab Minority Rights in Israel, said it would appeal the law to the High Court and ask that it be annulled. They claim the bill violates international law and the laws of torts. As far as I know, until yesterday every single Western country in the world, except for two, has laws making participation in boycotts against Israel illegal. Today, the UK stands alone in dishonor with no anti-boycott law on the books. For example, since 1976, it has been illegal for any US citizen to participate in the Arab boycott against Israel – punishable by fines of up to $50,000 or five times the value of the exports involved or jail term of up to 10 years. Where have Eitan Cabel and Ilan Gilon been? Why aren’t they ranting and raving against the United States for their similar "anti-democratic laws" that happens to try to protect Israel from boycotts? Wasn’t it just the other day the Left were attacking some anonymous video editor who used his right to free speech to juxtapose the brutal beatings of religious Jews by the police to that of images of storm troopers doing the same? Unless the Left hypocritically were supporting some law that limited free speech, while ignoring unquestionable brutality. And here we have a law that calls for civil penalties for those that effect an embargo against Israeli products because they are Israeli, and the Left are saying it impinges on basic freedoms. What a bunch of sick hypocrites. Labels: Boycott. Whisky boycott. BDS. Law. The news today is about a video that appeared on YouTube that juxtaposes scenes of Nazis brutally beating Jews to that of the Israeli police brutally beating passive religious teenagers, (unarmed) Settlers and Hareidi Jews, with some particularly harsh scenes from Amona. Now I for one have a problem when the Nazi comparison is brought up against fellow Jews (far too often the Israeli radical left uses Nazi to describe Israel when they forget the word Apartheid) . And so while on one hand it taints the video, on the other hand, this video would never have gotten the coverage it did without it. Why did the video get such coverage? Because as a result the police have opened an investigation. But an investigation into what? No, not an investigation against the incredibly brutal police violence that one explicitly sees in the video (including the identity of the brutal policemen), but against the makers of the video that simply juxtaposed videos of brutal police violence against that of brutal Nazis violence. Again, it's in poor taste, but Freedom of Speech is once again under (selective) attack by the establishment, all the while as this video slaps us across the face with explicit brutality of the police against right-wing and religious Jews - brutality that won't be investigated by this same establishment trying to shut the mouths of those they disagree with. The bright side of all this? On all the talkbacks I've read, while the media outlets tried to paint the video editors as evil, the talkbackers all concentrated on the police violence. I don’t think the main problem with the Left is that they are suicidal. The main problem is that they want to take the rest of us with them. Leftwing Israel Prize winner and Tel Aviv University film professor Yehuda “Judd” Ne'eman has called for a civil war in an interview with an Army Radio journalist. While a Technion physics professor, Oded Regev, said that he would volunteer in a civil war against the "extreme Right". Now we’re all used to these professors inciting violence against those they disagree with (the non-Left). There’s nothing new there. There’s also nothing new in that they won’t be investigated by the police or Shai Nitzan for their open incitement to murder and civil war. What’s interesting here is the line in the middle, and that really says it all about the mindset of the Left. This Leftist professor calls for a civil war. But it is a war he completely believes he will lose. It's like the Leftwing Israeli professors calling for international boycotts of Israeli academia (meaning their own jobs and universities). Can you imagine the self-hatred and warped ideology that is driving this man and his fellow leftists? They are demanding suicide for themselves (and for those around them) and asking other people to hurt them. Since Oslo, their Leftwing ideologies have repeatedly proven to be suicidal and dangerous to the country, and since they can’t seem to get those implemented fast and far enough, they call instead for a civil war that will at least wipe themselves out, and get plenty of other people killed in the process. These people don't need to be investigated by the police, they need to be committed into an asylum. But I do have to ask, would it be incitement on my part if I agreed with certain parts of his statement? 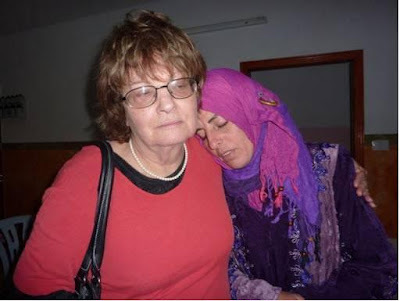 Secular Democracy in Egypt...the great white hope for liberal Westerners. Peace in our times. Mr. Ezz El-Arab said he accepted that the Nazis killed “hundreds of thousands” of Jews. “But gas chambers and skinning them alive and all this? Fanciful stories,” he added. With an Arab Spring like this, the Arab Summer Monsoons, Tornadoes and Hurricanes are soon to follow. Flying in the US these days is scary. Not so much because of the airplanes, but because of the TSA's overly-invasive scanning and groping techniques. Its going to get even worse...as the Guardian Reports today, terrorists are going to be surgically implanting bombs into themselves, that current technology does not detect. American officials have warned airlines that they believe al-Qaida is developing "belly bombs" to beat airport security and allow suicide bombers to launch terror attacks on board passenger planes. The department of homeland security has sent a bulletin to airline executives saying it has identified a potential threat from terrorists who could "surgically implant explosives or explosive components in humans". Although many airports use advanced imaging technology that can "see" through people's clothing, the technology might not pick up a bomb which is hidden inside a body. "Due to the significant advances in global aviation security in recent years, terrorist groups have repeatedly and publicly indicated interest in pursuing ways to further conceal explosives," said Kawika Riley, spokesman for the department's transport security administration. "As a precaution, passengers flying from international locations to US destinations may notice additional security measures." There is a solution which works, though the world is loath to use it -- profiling. Its been working successfully in Israel for years, and without overly invasive technology that does naked body scanning. Focus on the person and their intention; not 90 year old grandmothers or 5 year olds. Despite the rare slip up in which a weapon did get on board a plane from Israel's Ben-Gurion airport, it was never used in a terror act because the person was not a threat. Guns and bombs aren't the primary threat -- terrorists are. And they don't even need a bomb to bring down a plane, it can even be a box cutter. "We do not deal with a holocaust denier"